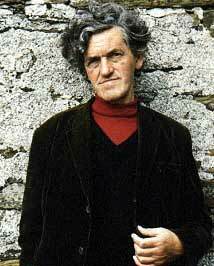 George Mackay Brown, a prolific writer of poems, novels and short stories, drew his artistic vision from the wellspring of the landscape, speech and sagas of the Orkney Islands where he lived for most of his life. After he left school he was taken ill with tuberculosis, and had a long spell recovering in a sanatorium in Kirkwall. On returning to Stromness, he took his first job, as a junior reporter for the Orkney Herald. At Newbattle Abbey College in Dalkeith, where he went to study in 1951, Edwin Muir strongly encouraged him in his writing. After further study at Edinburgh University he returned to Orkney. His first book of poems, 'The Storm', was published in 1954. The quality of his work really began to attract critical attention with the publication of 'Loaves and Fishes' (1959). Among the books that followed, 'A Calendar of Love' (1967) was his first collection of short stories, and 'Greenvoe' (1972) and 'Magnus' (1973) were his first novels. 'Beside the Ocean of Time' (1994) was shortlisted for the Booker Prize. His 'Selected Poems' was published in 1991. George Mackay Brown, Stromness, 1979.